Model for the Crystal Willow, 1985, downtown Bethesda, MD. Transformer's 2018 Collector's View Series hosted by Durwood Dixon, Washington, DC. Heather Krebs discussed the Rockne Krebs’ smoke drawing in Dixon’s collection. The Spencer Museum of Art, Kansas University, Lawrence, KS. Up Close with Steve Goddard: Drawings for Sculpture You Can Walk Through, a curatorial tour of the Rockne Krebs exhibition. Visiting Artists Series with Rockne Krebs, the notable light artist and sculptor. " Panelist, Visual Artists Rights Act of 1990, VARA, Panel Public Hearing, Library of Congress, Copyright Office, Washington, DC. Lecturer, University of South Carolina, Dept. of Art, Columbia, SC. Panelist, “Art Censorship After The Mapplethorpe Controversy” Panelists: David Elsner, Jim Fitzpatrick and Rockne Krebs. Sports and Entertainment Law Forum, University of Virginia School of Law, Charlottesville, VA. Lecturer, RISD Glass Visiting Artists, Rhode Island School of Design, Providence, RI. Lecturer, Maryland College of Art and Design, Silver Spring, MD. Lecturer, Visual Artists Series, Rockne Krebs, Laser Sculptor, SUNY-Plattsburgh, NY. Lecturer, “The development of Laser Art" Oklahoma Art Center, Oklahoma City, OK. Lecturer, UW-Madison Art Department Visiting Artist/Critic Program History, Madison, WI. Public Debate Panel between the Corcoran staff and artists: Bob Arnebeck, Sam Gilliam, Rockne Krebs, and Leslie Kuter, Corcoran Gallery of Art, Washington, DC. Panelist, "Sky Art Conference ’83" Center for Advanced Visual Studies, Massachusetts Institute of Technology. Rockne Krebs, Fellow, C.A.V.S., 1973-74. Panelist, Sculpture and Technology. CAA, 71st Annual Meeting of the College Art Association of America, Philadelphia, PA.
Lecturer/Panelist, “Sky Art Conference ‘82” in Linz, Austria. Center for Advanced Visual Studies, Massachusetts Institute of Technology, Cambridge, MA. Lecturer, Kansas University, Lawrence, KS. Lecturer, “Sky Art Conference ’81" Center for Advanced Visual Studies, Massachusetts Institute of Technology, Cambridge. The Christian Science Monitor, October 1981, Go fly some art. International Sculpture Center, Sculpture 11 Highlights, The 11th International Sculpture Conference, Washington, DC. Light Sculpture Panel with Rockne Krebs, Boyd Mefferd, Otto Piene and Hap Tivey. Site Defined Sculpture Panel with Lloyd Hamrol, Nancy Holt, Rockne Krebs and Mary Miss. Panelist, "Traditional vs. Non-Traditional Sculpture" School of Architecture, University of Maryland, College Park, MD. Lecturer, The Atlanta Contemporary Art Center, Atlanta, GA.
10th International Sculpture Conference: S/10: Sculpture Today, 1978, York University, Toronto, Canada, conference catalogue. Laser Demonstration, Rockne Krebs, The technology of lasers for sculptural use demonstrated with small lasers and illustrated with slides of larger works. Lecturer, Art League’s lecture series, Montgomery College, Rockville, MD. Lecturer, University of Oklahoma, Norman, OK.
Speaker, “Residuals for Visual Artists Conference” to establish legislation for royalties to visual artists. Congress of the United States, House of Representatives, Washington, DC. Lecturer, "Art & Philosophy Department presents two illustrated lectures by Rockne Krebs" Miami-Dade Community College, Miami, FL. Lecturer, “Rockne Krebs will discuss his public art sculpture, Sun Dog. 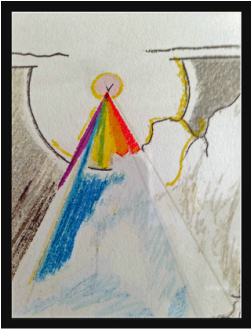 Sun Dog is the only work of art ever commissioned by the National Endowment for the Arts. It was installed at the John F. Kennedy Space Center, Cape Canaveral, FL. for the U.S. Bicentennial Exposition of Science and Technology.” Corcoran Gallery of Art, Washington, DC. Lecturer and Instructor, “Art in Public Places.” The Smithsonian Institution Associates Resident Program, Washington, DC. Lecturer, Oberlin College, Department of Art, Oberlin, OH. Lecturer, Canis Major and Atlantis by Rockne Krebs, The Omni International, Atlanta, GA. Lecturer, National Sculpture Center, Kansas University, KS. Lecturer, Summer “SIX” 1974, Skidmore College, Saratoga Springs, NY. Lecturer, Art, Technology and Environmental Sculpture Symposium, Rockne Krebs: Art and Technology – The Artist in the Environment, Lehigh University, Bethlehem, PA.
Speaker and Advisory Committee, Light and the Visual Arts symposium, American Association for the Advancement of Science, Washington, DC. Lecturer and Visiting Artist, University of Minnesota, Minneapolis, MN. The Sixth National Sculpture Conference, 1970, conference catalogue, National Sculpture Center, the University of Kansas, Lawrence, KS. Edited by Elden C. Tefft, published 1971. Catalogue has published transcript of Krebs’ lecture at the conference. Lecturer, Visiting Artists and Scholars, Atlanta School of Art, Atlanta, GA. Presentation and Discussion, The Washington Gallery of Modern Art, Washington, DC. Sculpture Minus Object: Non-Physical Structures Created by the Laser Beam. 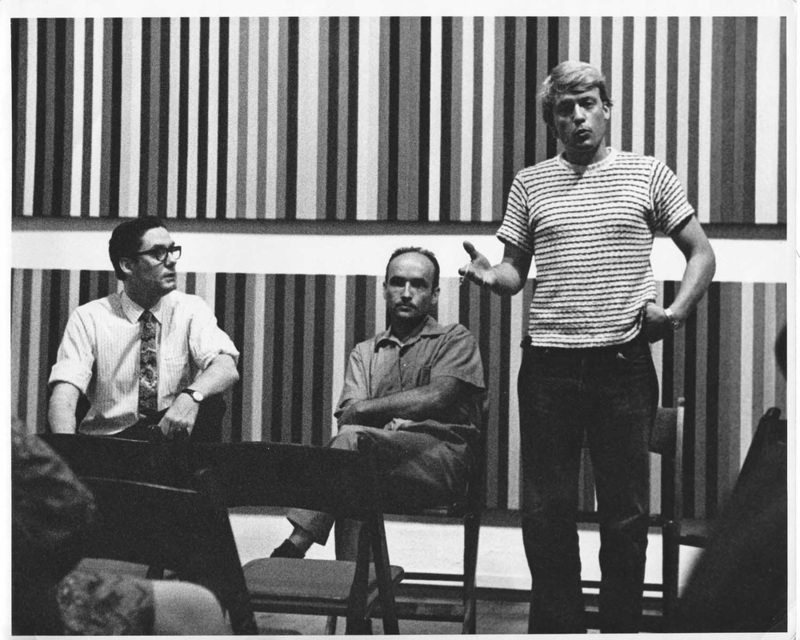 Lecturer, Visual Artist Lecture Series, Drexel Institute of Technology, Philadelphia, PA.
Panel, Washington Gallery of Modern Art, Washington, DC, Walter Hopps, Paul R. Haldemann, and Rockne Krebs, 1968.